Capoeira can be described in a lot of ways; it is creativity, intuition, grace, strength, history and tradition. It can also be described as an Afro-Brazilian martial art that combines elements of dance, acrobatics, and music. It was developed by African slaves laboring on sugar and coffee plantations in Brazil at the beginning of the 16th century; it began as a means of self-defense, allowing slaves to practice fighting without looking like they were fighting. Various tribes from West and Central Africa met and intermingled in the senzalas (slave quarters) and in the quilombos (escape slave nations). 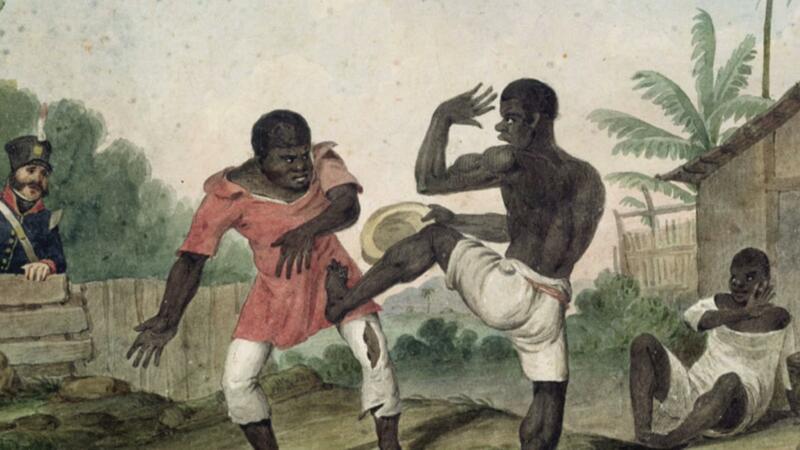 African slaves practicing Capoeira in Brazil at the beginning of the 16th century. 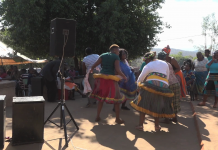 From this mix of African cultures came a melding of traditions, rituals, rites of passage, food, dance, language and religion. Slowly, a new Afro-Brazilian identity with a distinct set of cultural practices was born. With this new identity came the development of Capoeira, a practice that would years later be referred to as the art of liberation. Capoeira is practiced in a circle formation, called the roda, within which two or more capoeiristas – those who practice capoeira – participate in the martial art. There are also specific instruments and music that accompany the practice of capoeira: the berimbau, the pandeiro and the atabaque. The berimbau is an instrument with a single string and has African origins. This instrument drives the speed of the capoeira practice – or game as some call it – within the circle. The pandeiro is a tambourine instrument that accompanies the main beat of the capoeira music that comes from the atabaque, or the drum. These simple but beautiful instruments, combined with the voices of the members of the roda, create a unique sound that recalls the African roots of capoeira. 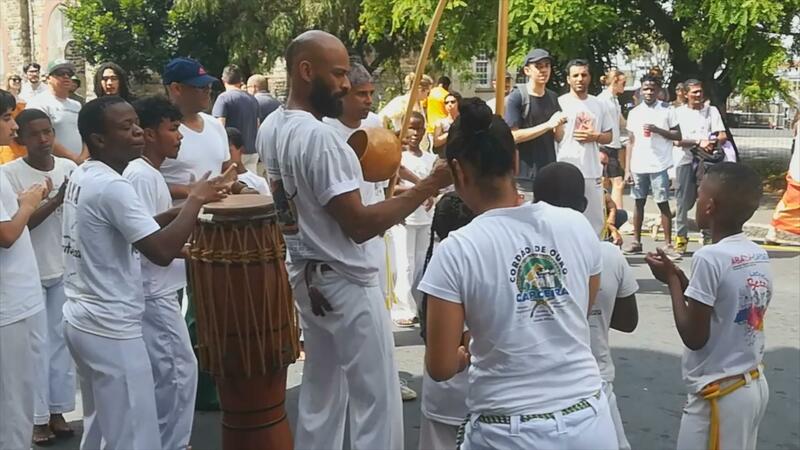 Showcasing Capoeira on the streets of Cape Town. 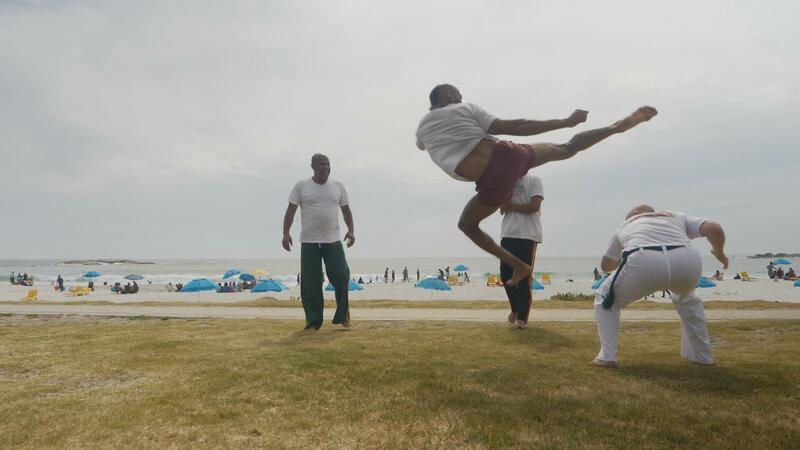 One man is keeping this potent martial art alive in Cape Town, South Africa, Marcio “Beleza” Lopes has been teaching Martial arts in Cape Town since the late 1990s. 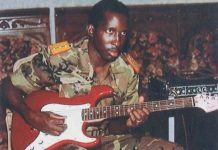 Beleza arrived in South Africa from his native Angola in 1999 to study. He was introduced to the art by his cousin, a capoeirista, Beleza fell in love with the fluidity of the movement and he enrolled for classes and the rest as they say it’s History. Beleza, a Purple belt, demonstrating Capoeira skills on a beach in Cape Town. He travelled to Brazil to train at the Abada School, where he sharpened his skills as a capoeirista, Beliza has made his life mission to teach capoeira to the young generation in the Cape Town area, He is working with the poor communities on the cape flats, an area outside Cape Town. He says that here Capoeira is making a positive impact in this local community. A Capoeirista has to be agile, to be effective in this sport. 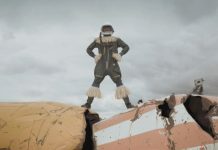 For Beliza, capoeira has made him identify with his African roots he says capoeira is his tribe now and he is determined to celebrate the strong African connection capoeira has to the continent. The future of capoeira is bright according to Beliza; the young generation is embracing the art in droves and as a result they are guaranteeing continuity of the lethal historical tradition.